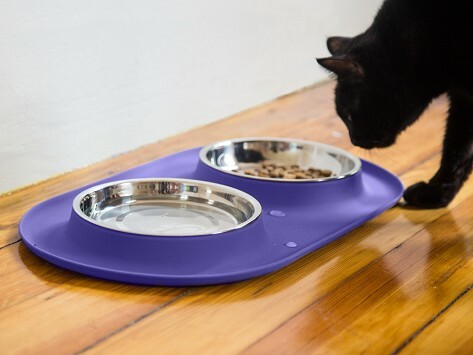 This sleek feeding station, for your small dog or cat, comes in eye-catching colors. The stainless steel bowls are removable for easy cleaning and the nonslip silicone base won’t damage your floor. A raised lip catches stray food to minimize your pet’s mess and can even be used outdoors. Dimensions: 18.5" x 10.2" x 1.2"
Great for my two cats. Very easy to clean and very durable. The cats liked it right away. I'd like it even better if it were possible to get an extra set of dishes. The cats have given it their seal of approval. I'd love it even more if I could get a couple extra bowls; is that possible? Their mess-catching, no-slip pet feeding stations look like something you’d eat out of, as Chris says. With Messy Mutts, living with your pets is much more fashionable.